Close your eyes and think about Manchester. One of the first things that probably springs to mind is football. This city hosts one of the most successful football clubs in the world – no other English football club that has won more league titles than Manchester United. Count Manchester City in as well and you’ll feel like you’re a kid in a sweet shop. Which game shall I visit? Which stadium will be next on my list? Where do I taste the infamous atmosphere of English stadiums? But, of course, there is so much more to do in this city apart from viewing the ‘beautiful game’. For example, music enthusiasts will be satisfied – Manchester is well-known for its pop culture and its massive influence in music, with bands like Oasis, The Smiths, and Stone Roses hailing from the great northern city. The easiest way for Brits to get to Manchester is by train (the journey takes only two hours from London!). Non-Brits can fly into Manchester Airport – there are plenty of low-cost airlines offering flights to Manny. 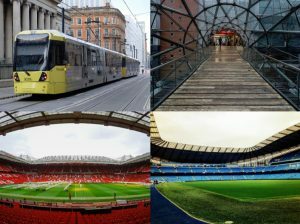 Once arrived, the best way of getting around in Manchester is by tram, the so called Metrolink, which will bring you from the city docks – where the Industrial Revolution began – to the Etihad Campus, where you’ll find the City of Manchester stadium. 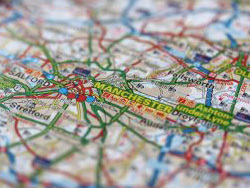 Our English school in Manchester is perfectly placed in the heart of the city, close to Piccadilly, the Arndale Centre and the Northern Quarter! The school is also close to two of Manchester’s main train stations which make it a great base from which to explore the rest of the UK. The ‘people’s club’ is based at a beautiful, modern stadium next to a brand-new training complex which has been built for Manchester City’s Youth Academy. With a capacity of 55,000, it’s the fourth-largest Premier League ground in the UK, and its masts and cabled roof structure draw in football fans from across the city. The best way to experience the stadium – aside from watching a match, of course – is to book a tour. Available throughout the year, the tour gives an insight into how the club is set up, how the stadium is maintained, and how players prepare before kick-off. We were lucky enough to visit both stadiums on our trip to Manchester. Though Old Trafford is one of a kind, we found the stadium facilities at the Etihad (such as the dressing rooms) to be better! Where United emphasizes its past successes, City (because they do not have any other option) looks to the future. As an ardent football fan, we’d recommend that any student coming to our Manchester school books their own stadium tour(s!) to experience the beating heart of sport in the city. Another must-see for football fans is the National Football Museum, which explores and preserves the history of the sport and its memorabilia. Speaks for itself, right?! We could talk for hours about football and football clubs in Manchester, but there is so much more to do and experience! If you’re in town you’d be hard-pressed to ignore the vast array of shops and boutiques, or the immense Arndale Centre, where you can scour the likes of TK-Maxx, JD Sports, and Hollister (among many others!). The Centre also has an 800-seat food court perfect for grabbing some sustenance during a day’s retail therapy. For more luxurious brands, head to Exchange Square – here you’ll find big names such as Louis Vuitton, Harvey Nichols, and Hermès. Alternatively, if you want to find a new outfit for a tenner or less, head to Piccadilly Gardens and take a look in the giant Primark. Manchester is famed for its vibrant ‘Gay Village’, located along and around Canal Street just south of Chinatown. The area welcomes all members of the LGBT+ community, providing a safe and friendly place to enjoy a night out, have dinner, or enjoy an afternoon snack. One of the most successful gay villages in Europe, the area attracts LGBT+ tourists from around the world. Formally an industrial hub by day and a red-light district by night, the Village is now a colourful celebration of Manchester’s gay, bisexual, and non-cis inhabitants and the cultures they share. 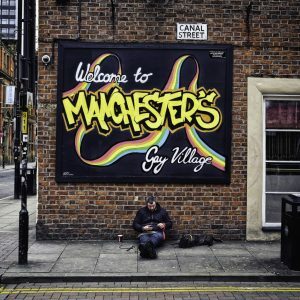 Though times have changed since the Village’s inception and society is more open to people from all walks of life, the historical hub of queerness in Manchester is worth a visit, if for nothing else then for its unique atmosphere! Are you more interested in history, or perhaps you have enough outfits to get through the next thirty winters? 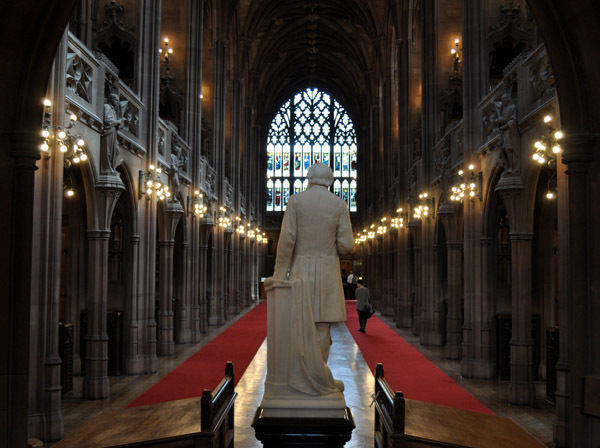 A stroll through the city will take you past the beautiful John Rylands Library, the imposing town hall at Albert Square, and other historical architecture such as Victoria Station, The Free Trade Hall, and – of course – the cathedral. The Imperial War Museum North shows the toll taken on the city by war(s), and also has a variety of exhibitions and events. Another recommended institution is the Science and Industry Museum, where you not only learn everything about the Industrial Revolution and its origins in Manchester, but you can also walk through the oldest train station in the world – definitely one to see! 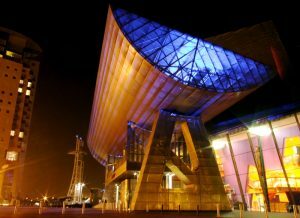 As a great way to end your day of English culture, why not take a visit to The Lowry, a beautiful arts complex near Salford Quays (accessible by Metrolink)? The complex boasts three theaters and a gallery showcasing local, national, and international artists. Here you can see musicals, pop performances, comedians, dance, and world-class opera. From Peter Kay to the Kirov Ballet, from Morrissey to Alan Bennett, there’s always something interesting taking place at the Lowry. Undoubtedly the best part of Manchester’s educational and cultural scene is that many of the city’s museums and galleries are completely free of charge. So, one thing is certain: you will never be bored in Manchester! P.S. Stay tuned for an introduction to another typical English city! Hint: in this city they pronounce K as GH.